Britain will present a draft resolution to the UN Security Council demanding an immediate ceasefire in Yemen following the deadly air strike on a funeral ceremony, the British ambassador said Friday. “We have decided to put forward a draft Security Council resolution on Yemen calling for an immediate cessation of hostilities and a resumption of the political process,” British Ambassador Matthew Rycroft told reporters. The draft text was expected to be circulated to the council’s 15 members later in the day, with a vote expected in the coming days. The decision to seek a formal resolution came after Russia blocked a statement drafted by Britain that condemned the air strike, apparently carried out by the Saudi-led coalition, that killed more than 140 people. Russian Ambassador Vitaly Churkin said the statement was “wishy-washy” and called for “some very serious thinking” should take place on how to address the deteriorating situation. One of the poorest countries in the Arab world, Yemen slid deeper into chaos when the coalition launched an air campaign in March 2015 to push back the Iran-backed Huthi rebels who seized territory including the capital Sanaa. Russia, which has friendly relations with Iran, has criticized Western backing for the coalition. In response to the attack on the funeral, a US warship in the Red Sea was targeted by a missile fired from territory held by the Huthi rebels. They have denied any involvement. 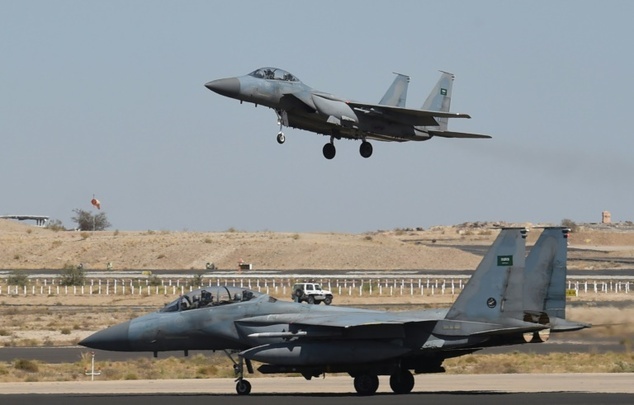 The United States, which has said it will review its participation in the Saudi-led coalition in Yemen, has launched cruise missiles at Huthi sites in retaliation. More than 6,700 people — most of them civilians — have been killed in Yemen since the coalition intervened, according to the United Nations. Yemen ranks as a level 3 emergency — the highest on the UN scale — with nearly 70 percent of the population of 21 million facing food shortages.